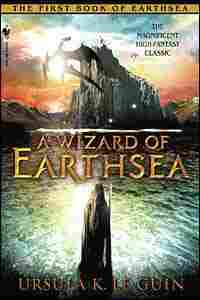 Excerpt: 'A Wizard of Earthsea' This story, recommended for fans of Harry Potter, tells the adventures of sorcerer Ged and the difficult tests he must face before he can attempt to re-establish the balance of power in his world. Get more suggestions from librarian Nancy Pearl. This story, recommended by librarian Nancy Pearl for fans of Harry Potter, tells the adventures of sorcerer Ged and the difficult tests he must face before he can attempt to re-establish the balance of power in his world. The name he bore as a child, Duny, was given him by his mother, and that and his life were all she could give him, for she died before he was a year old. His father, the bronze-smith of the village, was a grim unspeaking man, and since Duny's six brothers were older than he by many years and went one by one from home to farm the land or sail the sea or work as smith in other towns of the Northward Vale, there was no one to bring the child up in tenderness. He grew wild, a thriving weed, a tall, quick boy, loud and proud and full of temper. With the few other children of the village he herded goats on the steep meadows above the river-springs; and when he was strong enough to push and pull the long bellows-sleeves, his father made him work as smith's boy, at a high cost in blows and whippings. There was not much work to be got out of Duny. He was always off and away; roaming deep in the forest, swimming in the pools of the River Ar that like all Gontish rivers runs very quick and cold, or climbing by cliff and scarp to the heights above the forest, from which he could see the sea, that broad northern ocean where, past Perregal, no islands are. Duny laughed and shouted it out again, the rhyme that gave him power over the goats. They came closer, crowding and pushing round him. All at once he felt afraid of their thick, ridged horns and their strange eyes and their strange silence. He tried to get free of them and to run away. The goats ran with him keeping in a knot around him, and so they came charging down into the village at last, all the goats going huddled together as if a rope were pulled tight round them, and the boy in the midst of them weeping and bellowing. Villagers ran from their houses to swear at the goats and laugh at the boy. Among them came the boy's aunt, who did not laugh. She said a word to the goats, and the beasts began to bleat and browse and wander, freed from the spell. "Come with me," she said to Duny. As her sister's son he had been nothing to her, but now she looked at him with a new eye. She praised him, and told him she might teach him rhymes he would like better, such as the word that makes a snail look out of its shell, or the name that calls a falcon down from the sky. "Aye, teach me that name!" he said, being clear over the fright the goats had given him, and puffed up with her praise of his cleverness. The witch said to him, "You will not ever tell that word to the other children, if I teach it to you." She smiled at his ready ignorance. "Well and good. But I will bind your promise. Your tongue will be stilled until I choose to unbind it, and even then, though you can speak, you will not be able to speak the word I teach you where another person can hear it. We must keep the secrets of our craft." "Good," said the boy, for he had no wish to tell the secret to his playmates, liking to know and do what they knew not and could not. He sat still while his aunt bound back her uncombed hair, and knotted the belt of her dress, and again sat cross-legged throwing handfuls of leaves into the firepit, so that a smoke spread and filled the darkness of the hut. She began to sing. Her voice changed sometimes to low or high as if another voice sang through her, and the singing went on and on until the boy did not know if he waked or slept, and all the while the witch's old black dog that never barked sat by him with eyes red from the smoke. Then the witch spoke to Duny in a tongue he did not understand, and made him say with her certain rhymes and words until the enchantment came on him and held him still. "Speak!" she said to test the spell. This was Duny's first step on the way he was to follow all his life, the way of magery, the way that led him at last to hunt a shadow over land and sea to the lightless coasts of death's kingdom. But in those first steps along the way, it seemed a broad, bright road. When he found that the wild falcons stooped down to him from the wind when he summoned them by name, lighting with a thunder of wings on his wrist like the hunting-birds of a prince, then he hungered to know more such names and came to his aunt begging to learn the name of the sparrowhawk and the osprey and the eagle. To earn the words of power he did all the witch asked of him and learned of her all she taught, though not all of it was pleasant to do or know. There is a saying on Gont, Weak as woman's magic, and there is another saying, Wicked as woman's magic. Now the witch of Ten Alders was no black sorceress, nor did she ever meddle with the high arts or traffic with Old Powers; but being an ignorant woman among ignorant folk, she often used her crafts to foolish and dubious ends. She knew nothing of the Balance and the Pattern which the true wizard knows and serves, and which keep him from using his spells unless real need demands. She had a spell for every circumstance, and was forever weaving charms. Much of her lore was mere rubbish and humbug, nor did she know the true spells from the false. She knew many curses, and was better at causing sickness, perhaps, than at curing it. Like any village witch she could brew up a love-potion, but there were other, uglier brews she made to serve men's jealousy and hate. Such practices, however, she kept from her young prentice, and as far as she was able she taught him honest craft. As the witch kept talking of the glory and the riches and the great power over men that a sorcerer could gain, he set himself to learn more useful lore. He was very quick at it. The witch praised him and the children of the village began to fear him, and he himself was sure that very soon he would become great among men. So he went on from word to word and from spell to spell with the witch till he was twelve years old and had learned from her a great part of what she knew: not much, but enough for the witchwife of a small village, and more than enough for a boy of twelve. She had taught him all her lore in herbals and healing, and all she knew of the crafts of finding, binding, mending, unsealing and revealing. What she knew of chanters' tales and the great Deeds she had sung him, and all the words of the True Speech that she had learned from the sorcerer that taught her, she taught again to Duny. And from weatherworkers and wandering jugglers who went from town to town of the Northward Vale and the East Forest he had learned various tricks and pleasantries, spells of Illusion. It was with one of these light spells that he first proved the great power that was in him. Some of the villagers fled up the ravines and hid in the forest, and some made ready to fight for their lives, and some did neither but stood about lamenting. The witch was one who fled, hiding alone in a cave up on the Kapperding Scarp and sealing the cave-mouth with spells. Duny's father the bronze-smith was one who stayed, for he would not leave his smelting-pit and forge where he had worked for fifty years. All that night he labored beating up what ready metal he had there into spearpoints, and others worked with him binding these to the handles of hoes and rakes, there being no time to make sockets and shaft them properly. There had been no weapons in the village but hunting bows and short knives, for the mountain folk of Gont are not warlike; it is not warriors they are famous for, but goat-thieves, sea-pirates, and wizards. 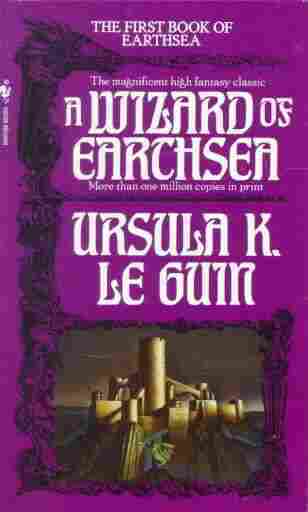 Excerpted from A Wizard of Earthsea by Ursula K. Le Guin Copyright © 2004 by Ursula K. Le Guin . Excerpted by permission of Spectra, a division of Random House, Inc. All rights reserved. No part of this excerpt may be reproduced or reprinted without permission in writing from the publisher.